This was extended to Sunday School which was held in a watchmakers workshop in Lord Street. Then a purpose built meeting room was constructed at the top of Lord Street with a Sunday School. Classrooms were added as numbers grew. 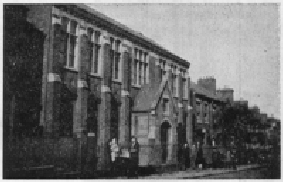 In 1866 Cow Lane Church, later Queen’s Rd adopted the school as a branch. In the 19th Century the Chapelfields area was home to many of the City’s watchmakers. In the main it consisted of good class streets of houses which had workshops built out at the back in which the watchmakers plied their craft. There was neither Church nor Chapel in the district which prompted three earnest Baptists in the area to start cottage worship meetings in 1860. 1891 saw the start of early morning men’s classes for reading, writing and Bible Study, a football team and a gymnasium. In 1915 a plot of land was bought at the top of Queensland Avenue big enough for a chapel and Sunday school. After generous giving, building began in 1927. My earliest memory is when my grandmother Pritchard took me to see my Uncle Len helping to build my new Chapel. He seemed so high on the roof I was afraid to speak to him in case he fell. The church opened in 1928 and it was Hearsall’s thanksgiving that it was free of debt. We are delighted that a Lord Street boy 97 years old Arthur Owen still belongs to our family and one of his Sunday School scholars at Hearsall, Ray Eaves. Two much loved members of our Fellowship.